Looking for a quality contractor to remodel your bathroom in Katy, Texas? Whether you want simple upgrades such as adding double vanities or wish to re-design the layout to create a more functional bathroom space, LYF Construction can help. Updating your bathroom to suit your desires while not only adds beauty and function to your home, but also increases the value of your biggest investment. LYF Construction has provided quality bathroom remodeling services in Katy for over 16 years and is qualified to update your bathroom to your specifications. Our skilled technicians will follow through with each request presented. The end result is bathroom that caters to your needs and whims. 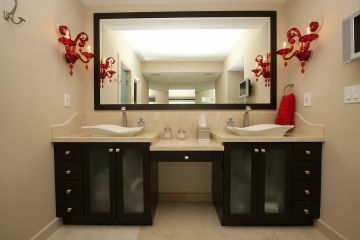 Call (832) 304-6764 for a free estimate to remodel your bathroom space. When you choose LYF Construction as your Katy bathroom remodeling contractor, you will receive top of the materials that won't burst your budget. You'll also receive professional and friendly service throughout the process. Our creative remodeling teams love working with area residents to transform bathrooms to match the dream baths they envision. We love to hear the "wow" when work is complete and customers first glimpse their updated Katy bathroom. Why Choose LYF Construction to Remodel Your Katy Bathroom? In addition to getting a crew that has a keen eye and passion for making every Katy bathroom remodeling project special and unique, you will also get a crew that has the knowledge and skill to complete the work on time and to your specifications. A professional project leader will be assigned to the job and will serve to ensure your complete satisfaction.